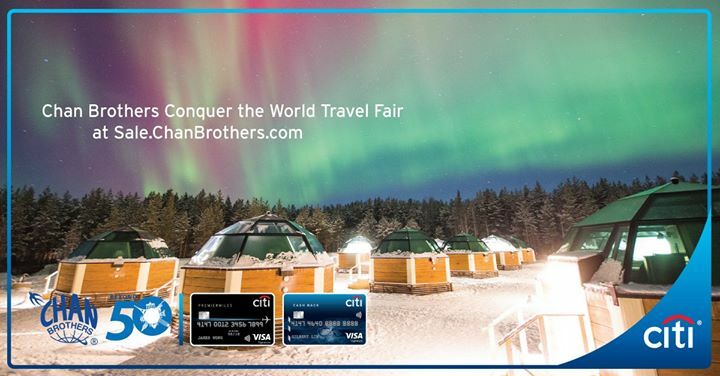 Citi Card Exclusives at Chan Brothers Conquer the World Travel Fair this Sat & Sun (29 & 30 Jul), 11am - 8pm, Suntec Exhibition Hall 404 (Level 4). Or visit Chan Brothers Travel Powerhouse at South Bridge Road, Fook Hai Building Level 1 & 7. Admission is free. Previous: [ROCK GIFTS AND BOOK CENTRE] Will you let Him? Next: [Trendy Eyes] Receive a $50 Robinsons voucher with every purchase of Porsche Design Eyewear.